Ant-Man (2015, directed by Peyton Reed) is a bizarre film to watch, not only because of its complicated production history, its momentary immersion into the Microverse, or the fact that freaking Ant-Man is getting a film before Black Panther, Runaways, Captain Marvel, or Ms. Marvel. No, the film is also bizarre given its approach to representing men and women. In which I kinda disagree with Noel Murray, and whine about how Amazon and Marvel format their e-comics. At The AV Club, Noel Murray writes about opportunities provided by appreciating the layout of comics when they are removed from the page and to digital e-readers, such as mobile devices like tablets and smartphones. 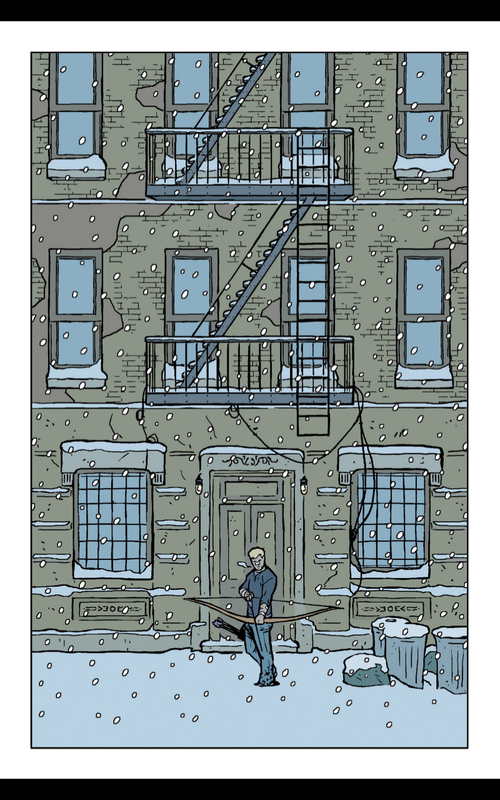 Murray’s experiment centers largely around only Issue #6 (the Christmas issue) of Hawkeye (December 2012 / February 2013), published by Marvel Comics, written by Matt Fraction, illustrated David Aja, colors by Matt Hollingsworth, letters by Chris Eliopoulos. Murray reads the comic on his iPhone to demonstrate how the dimensions of a smartphone screen enhance some parts of the comic, sticking to only a few panels of one page as they appear on his phone—that’s it, that’s the only visual example given. His iPhone has technology called Guided View, which as he reads intuitively crops portions of the original comic book page (which tends to be a little bit less than the usual 8.5 by 11-inch page—more like 7 by 10.5) to just a few panels at the time to take up the full space of his phone’s screen. “I’d never contend that Guided View is superior to reading a print comic. There are aspects of the experience that are annoying, such as how different panel shapes and alignments leads to a lot of flipping the phone 90 degrees to get the best perspective. And a lot of the best comics art doesn’t really work in this format. I’ve already mentioned Adams; but it’s also impossible to do a two-page Jack Kirby splash justice on a phone (or a tablet, for that matter). I don’t write the following to disagree with Murray’s thesis: indeed, mobile devices, including smartphones, have provided contexts for reading sequential art to uncover new facets to their formal elements. However, I am bothered by how much praise Murray gives to the mobile device technology that I think is still lacking, especially with major publishers. I think Murray does very well at identifying the potential of e-reader technology for comics, but Murray also oversells such technology when major distributors like Amazon and Marvel have designed unintuitive platforms that get in the way of reading comics that come in a variety of shapes and sizes. There are times when you feel even better about where you work. In its recently passed budget bill, the state of Wisconsin has significantly eroded all of those elements. A state renowned for its public higher education system, a system that has been a model for the nation for nearly two centuries, has taken steps that will greatly weaken its public universities’ faculty and staff, departments and programs, and academic and scholarly communities. Moreover, and most importantly, these actions will likewise negatively impact the education and experiences of the tens of thousands of students served by Wisconsin’s public education system. If you have not already, read the full statement at the NeMLA web site. Conferences are keeping me busy. Not only will Keith McCleary at UC San Diego and I be hosting the roundtable “Developments in Comics Pedagogy” at the January 2016 meeting of the Modern Language Association in Austin, Texas, but I get to work on additional panels about comics, graphic narratives, and now film adaptations at another convention. The Summer 2015 newsletter for the Northeast Modern Language Association, that I co-designed and edited, is arriving soon in members’ mailboxes, with a long list of 400 CFPs for sessions the organization is hosting at its March 2016 meeting in Hartford, Connecticut. You can read (and submit to) the CFPs online now, I’m scheduling daily tweets of CFPs @northeastMLA. The Marvel Cinematic Universe as Literature: With dynamic individual superhuman characters populating a world of complex, interwoven mythologies and origin stories, the films and television series of Marvel Comics Studios experiment with long-form transmedia storytelling. With twelve films and three television series released in less than a decade, all adhering to the same continuity and fictional universe, how can the Marvel Cinematic Universe reveal or offer fresh insight into the ways in which modern cinematic storytelling functions as literature? Approaches may include analysis of one or more films; storytelling across genre and medium; adaptations of the original Marvel Comics to film and television; and applications of various schools of literary and media theory to MCU properties. The Monster in the House: Domestic Ideology in Superhero Narratives: In worlds full of superhuman heroes, mythological imaginary creatures and battle narratives of epic scope, what is the role of the domestic? This session seeks proposals investigating the ways in which domestic spaces and domestic ideology function within superhero narratives as sites of union and/or conflict between the human, the subhuman, and the superhuman. Race and Comics: The Politics of Representation in Sequential Art: This panel welcomes papers that examine the treatment of race and racial relations in comic books, whether in superhero narratives, graphic memoirs, web comics, or other forms of sequential art both inside and outside the United States. How are comics used to document and represent racialized identities? How have the medium and its surrounding fan communities adapted earlier content to speak to current topics? “Ruined!” On Failed Adaptations from Page to Screen: This session will explore adaptations that fail in some way. Among our goals, we would like to identify what could be productive about failed adaptations. How do such failures identify what not to do, and can an adaptation that fails to be faithful to its source material still produce a valuable, worthwhile text? We are particularly interested in proposals that look at the adaptation of older artistic and literary forms in online and/or interactive content. In addition, I’m happy to see NeMLA feature more panels related to comics: this has been helpful for anyone with an abstract that is related to graphic narratives, as it increases the chances that interested persons can find a session on comics related to their topic, or can find a session that would be more than happy to feature presentations that use comics as their primary texts. I want to see this practice continue at NeMLA, and I am happy to see it take hold at other conferences. The deadline is September 30, 2015. Remember that NeMLA now accepts abstracts only submitted to their web site; the links above take you directly to each CFP, and all you need to submit is to register for a free NeMLA user account, for which you may sign up at those links. If you know anyone interested in submitting, please forward these CFP web links via email or social media.